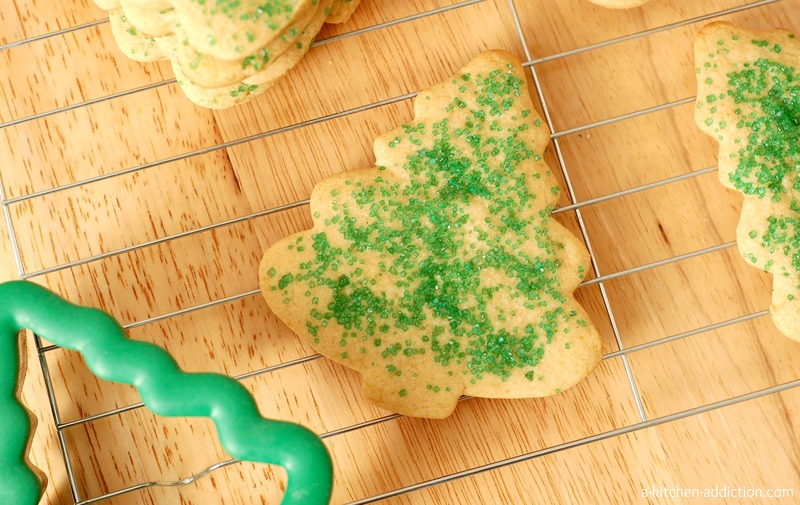 As you know sugar cookies are typically loaded with sugar, duh, and lots of butter. Christmastime is filled with sugar cookies either topped with more sugar or frosting (even more sugar!). I wanted to find a way to lighten up a traditional flavor without losing the richness and sweetness that everyone loves. I say everyone loves and not “I love” because I don’t really like sugar cookies. I know you may find this to be shocking, but I prefer just about any other cookie to a sugar cookie. They are just way too sweet for me. So, I had to make sure that someone other than me tasted the final result to decide whether or not these sugar cookies passed the “richness” and “sweetness” test. Enter my resident taste tester. 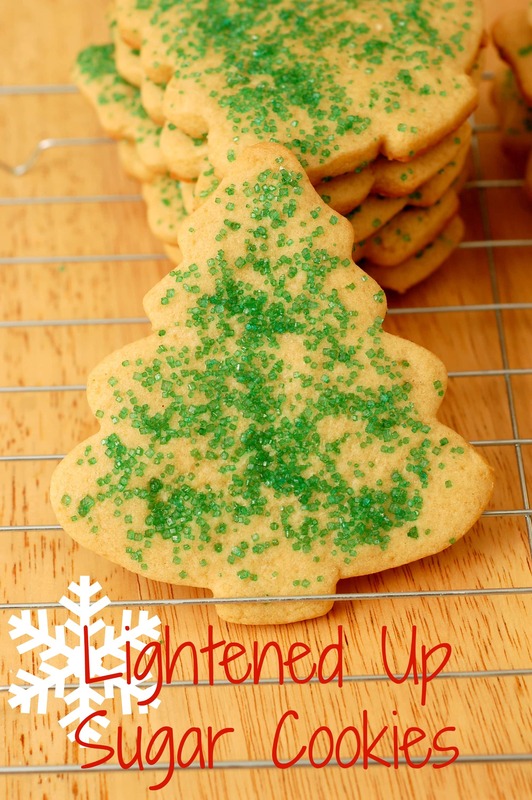 He thought they were great and wouldn’t have noticed that they were “lightened up” if he hadn’t seen my notes for the cookies on the counter! Unlike most sugar cookies that contain only white sugar or confectioner’s sugar, I also used brown sugar to bring an added richness to the cookie to make up for the lack of butter. If you prefer to have your sugar cookies have more of the traditional paler white color, you will want to use all white sugar. However, I found the brown sugar really only adds a very slight color to the cookie and lends a rich flavor that makes the slight darkness worth it. Preheat oven to 350. Line cookie sheets with baking mats or parchment paper. In the bowl of a stand mixer, cream together butter and sugars. Add in egg, vanilla, and milk. Beat until creamy. Stir together flour, salt, and baking soda in a small bowl. Slowly add the dry ingredients to the creamed mixture and beat until dough forms. Turn dough out onto a floured surface. Roll dough out to 1/4 – inch thickness. 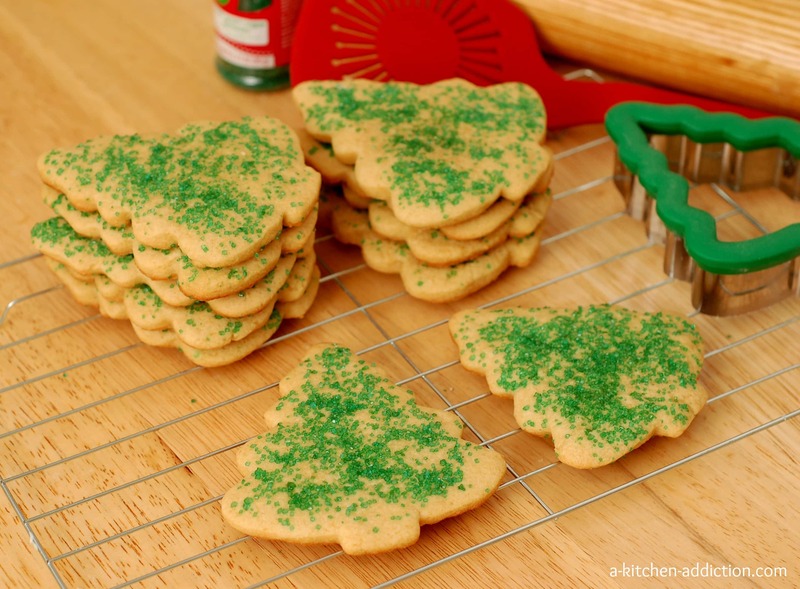 Cut out cookies with cutters and transfer to cookie sheets. Bake for 5-7 minutes or until edges just start to turn light golden brown. Allow cookies to cool for 3 minutes on baking sheet before transferring to a wire rack to cool completely. I am so going to try these–my grandmother’s recipe is wonderful but way too much butter to be good for you! If I don’t have Truvia, can I use splenda? Same amount? Good question. If you are going to use Splenda, you should use a 1/2 C since it measures the same as sugar. Truvia baking blend is twice as sweet as sugar, so you use half the amount when substituting it for sugar. Great recipe! I light the addition of brown sugar for richness – never thought of that! i think it’s about time i sneak some truvia into my cookies. 🙂 i want one of these festive little treats with lunch today! These are super adorable! Love the light version! Nicely done Jessica!! I love sugar cookies, but they can be so buttery and sinful! Love that you used brown sugar in these! I love that you lightened these up! 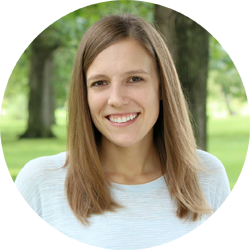 I’m already starting to feel the holiday snugness in my jeans, and it’s only December 5. These look like a must-try. I love the flavor of brown sugar, and I’m so glad you added them to these cookies. sugar cookies are never my favorite, but i do eat one or two of my grandma’s classic recipe. i love that you lightened these up though–maybe i’d like them more! Lightened up sugar cookies? Genius! I love sugar cookies but sometimes too, I find them to be overly sweet. We get Truvia over here but not the baking blend.. yet. Do you think the Truvia replacement for granulated sugar would be OK to use? I love the lightened up version! Brown sugar in cookies is goooooood. Totally pinned! I am shocked! lol…but so sweet of you to share …i love the twist on this recipe!!! Regular sugar cookies can be way too sweet for me, too, so I totally appreciate these. They look + sound just wonderful! Your cookies look perfect, I love the idea of brown sugar in them! I have never used Truvia in baking…I must give it a try. I love sugar cookies. Not too sweet for me! Unless it has all that icing on it. I can deal with cream cheese frosting but royal or buttercream? Yuck. It’s great that you lightened them up. You know I’m all about that so I love this post!